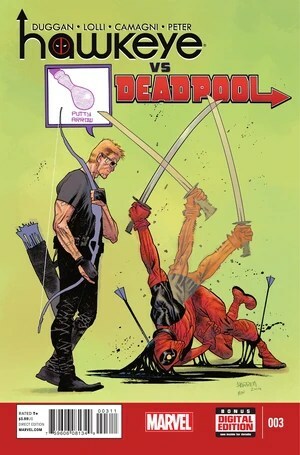 If you had told me that one of the enjoyable comics in my pull lately would be one of the bajillion Deadpool miniseries that have been coming, I probably would have… well, maybe not have laughed, but given you a skeptical look. It’s not that most of them are bad, it’s just that they don’t tend to be super interesting. While Deadpool Vs. Hawkeye doesn’t quite measure up to Deadpool at its best, or Hawkeye at all, it does manage to pull in a lot of the charm of both. The characters all click amazingly well, too. Kate Bishop is the real scene-stealer (“Oh god, I blew up New York”), despite Clint Barton and Wade Wilson getting top billing. Watching the bad guys have minor computer problems, like not being able to find a thumb drive on the desktop was the kind of bizarre, mundane, wonderful scene that doesn’t really exist outside this miniseries and its parent series. I’m kinda sad there’s only one more issue left. Also, Deadpool continuing to use Uber (Ooper) to get to and from missions? YES. This series just keeps growing and growing on me. The characters feel more fleshed out, the art is really getting into stride… it’s feeling less like just a Sandman Spinoff, and more like its own beast. The philosopher ghost cats work much better as amusing animal sidekicks than the usual addition, which tend to rely on cuteness over actual interesting behavior. The detectives interacting with a medium while she tries to ignore them was confusing, but not in a bad way at all- all of the characters involved in that scene, especially the customer, are absolutely bewildered themselves. It’s a great little setup. Despite the videogame being the cover hook, it doesn’t actually get a lot of screen time, but what we do get looks really good. Remender and company have completed their first year of the comic, and it was a good one. They’re really starting to move into a new phase, though- one where the characters are actually being proactive, rather than just desperately starting to survive. The comic is spiraling towards finally showing off some of the secrets behind its multiverse, and its about time. It also finally picked up a cute mascot character, which happens to be pretty superfluous and forgettable, as well as not actually being that cute. That’s my only real complaint about this one, though. Hell, the thing is 29 pages long, without sacrificing any art quality. That’s pretty impressive, if you ask me. Also, millipede death cults? Still cool. I know I say this about every issue of Letter 44, but man, is the political drama on the ground more interesting than the action up in space. Somehow, it manages to focus on a smaller, more fleshed out cast than the enormous one on the spaceship, who have finally made contact with the aliens themselves, not just their drones. The aliens seem weird and interesting, and speak only in states of change, but I haven’t seen enough to really make a call regarding them. The spoiler regarding their intentions… well, isn’t really that much of a surprise, let’s say that. On the ground, the First Lady proves herself a seriously scary customer, and the George W. Bush stand in proves to be a great villain. We’re finally starting to learn about Declan’s past- but whether it is his actual past, or just an insane fabrication is yet to be seen. Swivel, despite his absolutely horrifying appearance, just isn’t quite as menacing as Nimble Jack was. He just keeps doing the same things over and over again- there is only so much severing of fingers you can see before it stops being shocking. Still, though- the art remains excellent, and I’m very excited for the next issue. Welp, looks like Sixis is finally done! It’s about time, too. Zenpool isn’t a bad character, but he’s certainly not a great one, either. 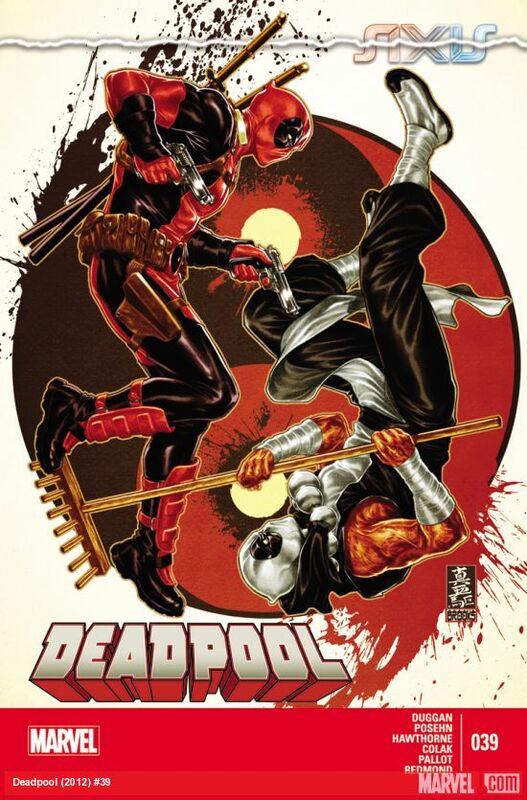 Despite being a whole new path for Deadpool, it didn’t feel like character growth for him at all- it wasn’t earned. Wade certainly learned some lessons from the whole escapade, but I don’t even feel like they were particularly good ones. The cast did pick up a new character (Teenage Apocalypse, hurrah! ), but we’ll have to see how that turns out. Maybe it will be a chance for Deadpool to continue his personal growth, or maybe it will just lead to more scenes of Deadpool, Ben Franklin, and the rest of the roomies playing videogames. 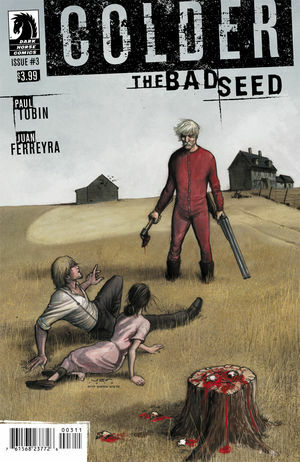 Good art, well written dialogue, more repetitive tries at a new take on superheroes. It’s not that it’s a bad comic- it feels very reminiscent of the cynical tone of The Authority, which I’m a huge fan of (anything Warren Ellis, really). It’s just that I have a pretty limited interest in superhero comics anymore. Other than this one, I’ve got Deadpool and Hawkeye Vs. Deadpool, neither of which tries to be revolutionary. It can be done still- look at Hawkeye itself. Fraction and Aja, despite their update schedule, have been taking that comic to amazing new places. They’re Not Like Us is really very solid. I’m a little leery about introducing ensemble casts in the first issue anymore, but it mostly follows two characters. If you’re not as cynical about superheroes as I am these days, it’s definitely worth a browse. Will it be staying in my pull? Dunno yet. We’ll wait for #2. Posted in Comics, Weekly Pull Review and tagged Black Science, Colder, Colder: The Bad Seed, Dark Horse, Dead Boy Detectives, Deadpool, Hawkeye vs Deadpool, Image, Letter 44, Marvel, Oni, review, Rick Remender, They're Not Like us, Vertigo on December 27, 2014 by mountainwashere.